How helicopters work, fly & turn (Animation) ? Very few are lucky enough to take a ride in a Chopper & I am happy to be one of them ! Anyway, helicopters are indeed one of the most interesting machines from which I know so far. Subjects like flight mechanics & helicopter dynamics are not for weak hearted ones; they are seriously challenging to study ! Well keeping those complex calculations, equations & relations aside, lets at least know how helicopters work, fly & are steered ! In simple words, helicopters are types of rotorcrafts in which thrust & lift are generated with the help of rotors. Unlike airplanes in which lift is generated through their large wings mounted sideways, rotors are located on the top of the cockpit/helicopter body. The English word ”helicopter” is adapted from the French word hélicoptère, which originates from the Greekhelix(meaning helix, spiral) & pteron(meaning wing). Nicknames like heli, chopper, helo & copter are quite popular among people. The 2nd best thing about helicopters is that it can take off & land vertically, is able to hover, fly forward, sideways & even reverse ! Along with it, they require less space for landing & take off. You might be wondering which is the best thing then ? Well, hold on your horses, I have discussed later in the end of the article ? . The first manned helicopter flight was achieved by the Frenchman Paul Cornu who lifted his twin-rotor craft off the ground for 20 seconds in 1907, his machine unfortunately broke up on landing. In 1909, Igor Sikorsky built two helicopters but these could lift very little more than their own weight. The first practical helicopter was the GermanFocke-Wulf FW 61, which flew in 1936. The first helicopter to carry three occupants was the British made- Weir W.6’s prototype in 1936. The real breakthrough came when Sikorsky came with the solution of torque reaction with his VS-300 in 1939. How are helicopters powered ? Helicopters are powered by turboshaft engines- a special type of jet engine situated in the rear part of the fuselage section. Conceptually, they are pretty similar to turboprop and other types of jet engines except that these engines are not used to produce thrust. Jet engines used in airplanes produces thrust which helps them to propel forward while helicopter needs shaft power. The rotor blades are coupled with the shaft which produces lift. How do helicopters fly ? The rotor blades act like the airplane wings when they move through the air. Each blade is an aerofoil: a wing with top surface curved & the bottom surface almost flat. The flow of air over an aerofoil/ rotor blades of a helicopter. Consider the flow of air over a single rotor blade. The air flows faster on the top side of the rotor blade compared to the air flowing on the bottom side. The difference in the speed of flowing air creates a difference in the pressures generated on both the side of the rotor blade. A high pressure region is generated below the the blade & a relative low pressure above the blade. This produces an upward force called lift on the rotor blades. When the upward force exceeds the weight of the helicopter, it starts to get off the ground & stays up in the air. The lift/upward force can be controlled by changing the pitch/angle of attack(the angle at which air strikes the blade) of the blades. Increasing the pitch(upto certain angle) increases the lift & vice versa. Thus the pitch of the blades is kept maximum during take off & is reduced gradually while landing. The pitch of the rotor blades is controlled by something called as collective pitch stick. 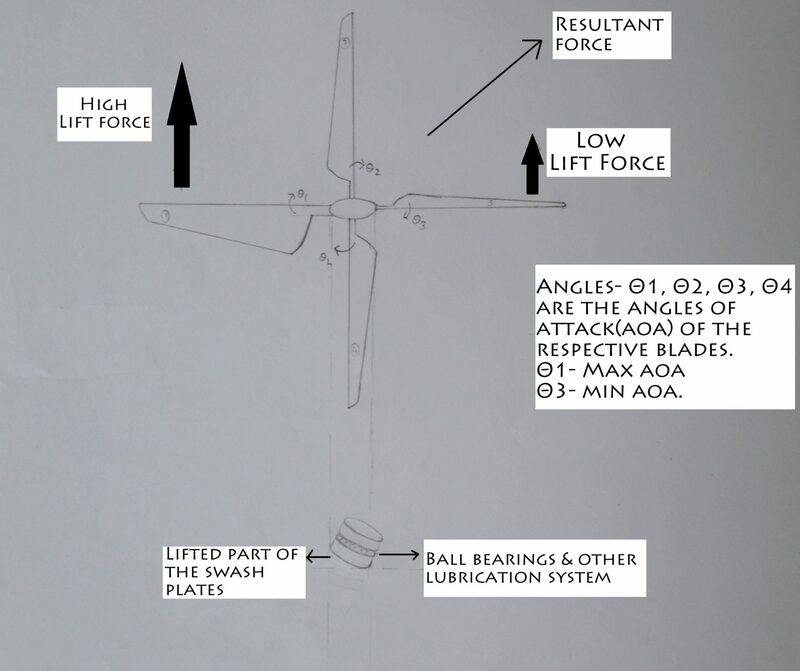 A mechanism comprises of 2 plates: upper & lower swash plates & pitch links are used to control the angle of rotor blades. The lower swash plate(silver colored) doesn’t rotate or spin along with the rotors but can tilt & move up-down as per the pilot’s movement. The upper swash plate(blue) is located above the lower plate(obviously ? ) with ball bearings between both of them. These ensures least friction between both the plates & also lets the upper plate spin. The animation shows how lift is achieved by changing the pitch of rotor blades ! When the pilot pulls the collective pitch stick, both the plates are pushed upwards. The upper plate is thus able to change the angle of attack with the help of pitch links. How are helicopters steered ? OR How is forward flight achieved ? Now this is pretty impressive & damn interesting. A million dollar question, isn’t it ? Okay so we’ve got our mechanism right here, we just have to understand it. The lift is controlled by the collective pitch stick while cyclic pitch control is used to fly forward & sideways or in any direction. The cyclic pitch control is used to tilt the rotor blades which makes the helicopter to fly in a particular direction. To tilt the rotors, instead of pushing the whole swash plate only one side of the plate is raised. From the previous para we know that angle of attack increases when the swash plate is pushed up. In this case(tilt), the angle of attack(AOA) will be greater in that region where the swash plate is at a higher position. The animation clearly shows it ! The animation shows how AOA of each blade is different at the same time ! Imagine we’ve tilt the plates in RIGHT direction which means that the LEFT part of the swash plate is at a higher position. In our case, AOA will be greatest in the left side while the least in the right side. The difference in the AOA creates an unsymmetrical force distribution which pulls the copter in right side. Thus tilting the rotor in different directions enables the pilot to steer sideways & achieve forward flight ! An illustration which shows the position of swash plates corresponding to the angle of attacks of blades. Greater lift force is produced in the left side(blade 1) since the AOA is maximum(Θ1). While the lift force produced is minimum on the right side(blade 2) since the AOA is minimum(Θ2) amongst the four blades. The resultant of both the forces tends the helicopter to move in the right side. Thus pilots are able to steer in any direction just by tilting the swash plates. Don’t misunderstand the mechanism by thinking that forward flight is achieved by tilting the rotor mast itself ! The rotor mast is never tilted; flight is controlled just by adjusting the angles of the rotor blades. Know the most interesting fact about Helicopters at the end of the article ! Why do some helicopters need a small tail rotor ? Newton’s 3rd law of motion says that: Every action has an equal & opposite reaction. Lets apply it to our chopper then. The torque produced by the heavy shaft as well as the blades(action) tends to rotate the helicopter body in the opposite direction(reaction; counter-rotation). This reaction is called anti-torque. The rotor wings rotate at a very high RPM, thus possessing high angular momentum. According to conservation of momentum, the momentum of the system must be constant. The angular momentum of rotor blades rotating in clockwise direction causes the body of the helicopter to rotate in anti-clockwise direction. Thus to horizontally stabilize the helicopters, tail rotors are used. The working of the tail rotor is similar to the rotor blades except that they cannot be tilted(there is no need). The tail rotor pushes/pulls against the tail to balance the torque reaction & has become the most common configuration for helicopter design. Tandem rotor helicopters consist of 2 large horizontal rotors one mounted in front of the other. The first rotor rotates clockwise while the other rotates in anti-clockwise direction which eliminates the torque reaction. Advantage of this system is having a good longitudinal stability since it has a large centre of gravity range. Tandem rotor helicopters are able to hold more weight with shorter blades since they have two sets of rotors. Due to this ability of carrying greater capacity this config. is mainly used for cargo helicopters. Disadvantage of tandem rotor config is the complex transmission system. Both the rotors are to be properly synchronised such that they don’t hit each other even after engine failure. In this config two rotors are mounted one above the other on concentric shaft with the same axis of rotation rotating in different directions. This again resolves the issue of torque reaction as well as it enables the heli to increase it’s carrying capacity. Advantages includes increased payload for same power delivered by the engine; also the full power could be concentrated to lift & steering since there is no tail rotor(some of the power gets wasted while transmitting to it). Disadvantages – high number of moving parts, greater mechanical complexity & design since one rotor has to be mounted over the other along the swash plates & pitch links. Transverse rotor rotorcraft have two large horizontal rotor assemblies mounted side by side. Like tandem rotors, use of counter-rotating rotors cancel out the other’s torque. Similarly, this config is able to hold more weight because of two sets of rotors. 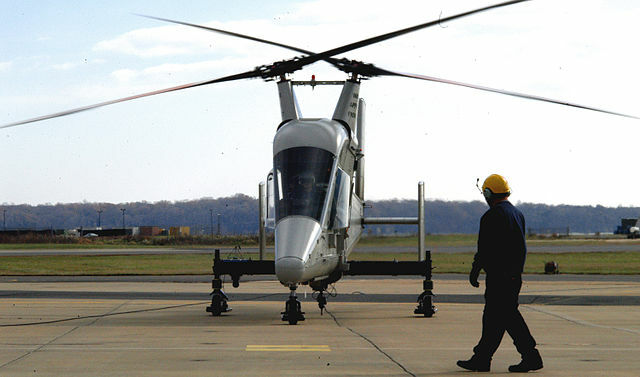 Kaman K-MAX having intermeshing rotor configuration. You might wanna know about How do Hovercrafts work ? After engine failure, the pilot disengages the rotors from the engine. The free falling causes the autorotation of the rotor blades. The rotors start rotating by the action of air moving up through the rotor with out the engine. Thus pilot is able to safely land the helicopter by changing the direction of flight & technique of autorotation ! Hats off to those smartass engineers who study, design & make these awesome stuff ! Aren’t helicopters really one of the most interesting machines with such incredible mechanisms ? Please share your thoughts in the comment section below & let me know if you don’t get any of the points above ?